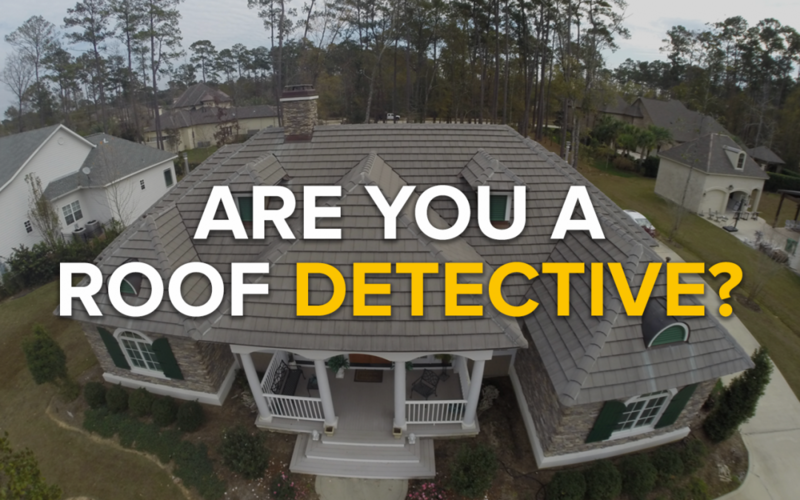 Are You a Roof Detective? When it comes to repairing or purchasing a roof, it is ok to ask questions to ensure your home receives the highest quality treatment for the best price. Although there is an innumerable amount of inquiries to throw at a potential roofing contractor, we narrowed down some of the most critical questions that need to be addressed. Here are our top five questions to ask before hiring a roofing company–no spy glasses, pipes or disguises required! 1. Can I Get This Estimate in Writing? Starting a roofing project can be exciting, but watching your bank account deplete can be a bit of a buzzkill. Before a single tile is purchased, discuss how much you are willing to invest into your new roof, and work out a solid financial plan. You want to be prepared for any costly interruptions during the project. 2. Does Your Company Have Liability Insurance and Workman’s Compensation? No homeowner wants their roofing project to turn into a legal battle. It is important to make sure the company you hire for the job can be trusted not to hold you accountable for any accidents that could occur on your property. While workman’s compensation takes care of the workers themselves, liability insurance will keep you out of legal danger. Request a copy of the insurance statement or contact the insurance company directly for verification. During this conversation, be sure to ask about state licensing. With all your bases covered, you can be confident your home will receive quality craftsmanship, and the contractor will be comfortable providing services in your area. 3. Are You a Local Company? People tend to support their communities by buying locally, and dealing with local roofing companies is just another way to do it. Staying local is also important for ensuring your roofing project is done correctly. If something does happen to it after its completion, you can have your contractor come back to take a look at what went wrong. The same cannot be said for someone who came in from out of state. 4. Are You Planning on Removing My Old Roof? Unless a contractor has x-ray vision, it is difficult to determine the integrity of the wood underneath your old roof; however, some companies choose to work around the current shingles instead of completely pulling it all up. Ask about a contractor’s process for roofing projects, and determine for yourself what would be best for your home. 5. How Many Years of Warranty Will My Roof Have? According to greatdayimprovements.com, roofing materials have not particularly gone up in price over the years, but the quality has greatly increased. A properly installed roof can last for decades, so your family can feel comfortable and safe all year long. If you are considering a new roof, contact a company that has all the answers to these questions and much more: V & V Roofing. We provide competitive prices for your projects while offering the best roofing materials to match your preferences.